Stores like Nike, Children’s Place and American Eagle beckoned us to come in and join the crowd that was searching for "just the right look." It was way too expensive and half of my budget was being blown in just one store! How had our total gotten that high, that quick? Ugh! Begrudgingly I pushed the “Yes, it’s okay” button. I felt a little guilty doing it, and I wondered later if it was a sin to lie to a machine. New things aren’t cheap these days are they? And, as much as I love shopping for our five kids, we try to keep our “excursions” few and far between. Maybe that’s why the high price tags sometimes catch me off guard. It’s funny how price tags work, isn’t it? Placing a value on things can be a tricky task and sometimes I think it’s a mental game. If the seller prices something too low, people automatically think it’s cheap but when you set a high price tag on something– there’s often an instant recognition of value. With a gleaming look in his eyes, he said that they planned to shovel the dirt from historic sites and sell it in packages to people. I thought his idea was kind of “out there” until a few Christmases ago when my husband received an interesting gift from his brother. “You’re going to love this,” his brother had written in the card. What was inside? A set of coasters with a capsule of dirt in each that came from the old Yankee Stadium. It was antique dirt! Who would have figured? And yeah, my husband loved them – especially because of the dirt. Suddenly, it had value. A few years ago, I was going through a spiritual battle. I was listening to all of the lies the devil could dish out, and to say the least -- I was a wreck. If we do a little research on what that price was, we find that we are worth way more than any price tag in the world. Feeling kind of low today? Maybe you’ve blown your budget, just like I could have easily done last weekend. Or, maybe it’s something deeper, and you’re questioning your worth. 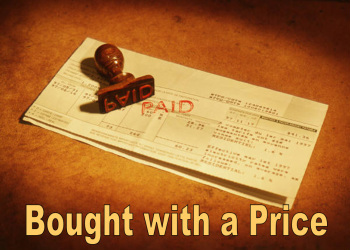 God’s already paid the highest price possible for you. If you went through a “holy” check out machine, the display price would read “Jesus” just for you. And you know what? God’s already pushed the “okay” button. own]. So then, honor God and bring glory to Him in your body.